Velociraptor (Actual Size) - Velociraptor is a genus of dromaeosaurid theropod dinosaur that existed approximately 75 to 71 mya (million years ago) during the later part of the Cretaceous Period. Only two species are currently recognized, although others have been assigned in the past. The type species is V. mongoliensis; fossils of this species have been discovered in both Inner and Outer Mongolia in central Asia. A second species, V. osmolskae, was named in 2008 for skull material from Inner Mongolia. Smaller than other dromaeosaurids like Deinonychus and Achillobator, the turkey-sized Velociraptor nevertheless shared many of the same anatomical features. It was a bipedal, feathered carnivore with a long, stiffened tail and an enlarged sickle-shaped claw on each hindfoot, which is thought to have been used to kill its prey. Velociraptor can be distinguished from other dromaeosaurids by its long and low skull, with an upturned snout. Velociraptor (commonly shortened to 'raptor') is one of the dinosaur genera most familiar to the general public due to its prominent role in the Jurassic Park motion picture series. In the films it was shown with anatomical inaccuracies, including being much larger than it was in reality and without feathers. It is also well known to paleontologists, with over a dozen recovered fossil skeletons-the most of any dromaeosaurid. One particularly famous specimen preserves a Velociraptor locked in combat with a Protoceratops. 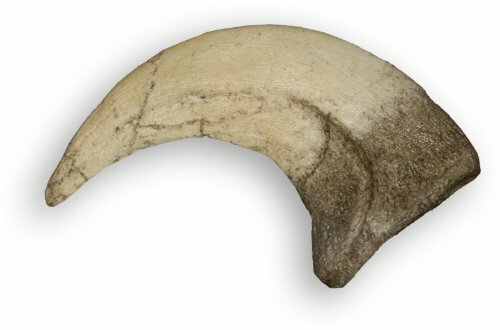 Labeled - "Mini Velociraptor Claw"
If you have any questions about this product by Skulls Unlimited International, contact us by completing and submitting the form below. If you are looking for a specif part number, please include it with your message.